This Portable Document Format (PDF) collage features a mix of 12 international travel labels from the UK, Denmark, Norway, Sweden and Finland. The Golden Era of Travel provided extraordinary travel-themed artwork in the form of luggage labels. They were used to advertise hotels, cruise ships, train companies, airlines and other exotic destinations. There is evidence to suggest that hotel trade-cards were occasionally affixed to items of luggage, probably to facilitate their transport to the correct establishment. Ultimately, luggage decorated with labels from important and exotic places became a symbol of one’s class and status. The PDF downloads are crafted from digitally enhanced quality images from original vintage luggage labels. Files can be saved to your PC or MAC and then used over and over again. Each labels on the sheet measures 2 1/2″. These digital sheets are formatted to print on Avery® White High-Visibility Labels for Laser Printers 5294, 2-1/2″ which can easily be purchased online. When used with self adhesive printer paper, these labels can be printed and pasted on many surfaces like books, laptop, boxes, pieces of luggage and much more. You can alternatively print our PDF files on any A4 paper your printer allows, like for instance a full A4 sheet sticker and cut them off individually by using a round 2.5″ glass or shape, and a cutter. You might also want to use a stickier paper if you want to paste the labels on your suitcase, as the Avery labels are easier to peal-off over time. Keep in mind that after printing, leave the labels to dry before using, as the ink could rubs off if you use them immediately. The image preview on the page is a low resolution jpg and is not suitable for printing. The copy that you receive will be in a high resolution PDF format. 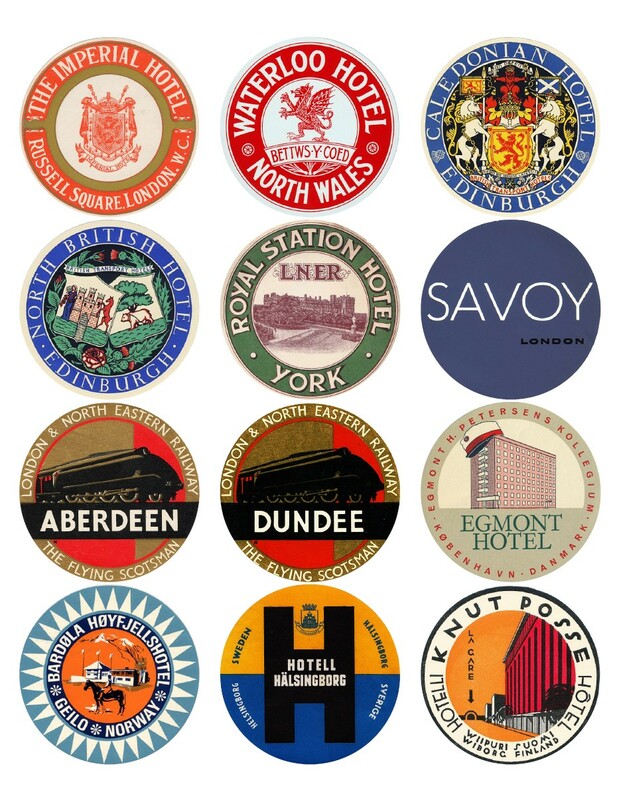 If you want to test print our labels before purchasing them, you can download and print our free “12 Vintage Travel Stickers: World Mix” pdf collage. If you are happy with the results, you can securely proceed with purchasing more labels, as they all have the same printing template. Due to the nature of our downloadable files, they may not be returned for credit. No refunds on digital downloads. For that reason, please contact us with any questions you may have prior to the purchase. After checkout, you will be redirected to the “Purchase Confirmation” page from which you will be able to download your file. Downloads are available once your payment is confirmed (or immediately after you click “check out” for the free downloads). If you paid with PayPal, confirmation may take a few minutes. You will also receive by email a “Purchase Receipt” containing a direct download link, so you can download your file as many times as you wish. These files are Portable Document Format (PDF), an open standard for electronic document exchange. In order to visualize the downloaded file, you will need Adobe PDF installed on your computer. If you don’t have yet Adobe PDF, you can download it here for free. Save 44% on this pack and every other bundle we’ve ever made with our 228x VINTAGE TRAVEL STICKERS: THE FULL LABELS COLLECTION. Only $176.12 instead of $264.22 (Limited Time). A Vintage Travel Labels repository that brings a little sunshine to all travelers & vintage enthusiasts from around the world. Follow us on Facebook!